Bill Kovach remembers helping The New York Times reporter Neil Sheehan get the Pentagon Papers out of Boston and down to New York. 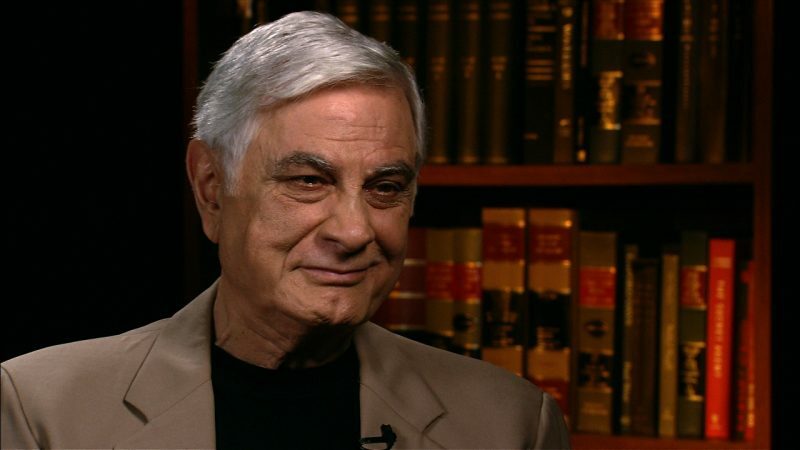 Bill Kovach discusses his seminal book, co-authored with Tom Rosenstiel, about the profession of journalism. Bill Kovach talks about becoming the editor of The Atlanta Journal-Constitution and the award-winning work the newspaper did on racial discrimination by banks regarding mortgage applications. Immediately after graduating from high school, Kovach joins the U.S. Navy. After four years of military service, Kovach attends East Tennessee State University on the GI Bill and graduates four years later with a bachelor’s degree in biology. To make money before graduate school, Kovach works for the Johnson City (Tenn.) Press Chronicle and decides to pursue a career in journalism. Covering the 1960 Senate election in Tennessee, Kovach meets David Halberstam, who is working for the Nashville Tennessean, and they two spend three weeks traveling together while following the story. After Halberstam leaves the Tennessean for The New York Times, he recommends Kovach to his editors as a possible replacement. Kovach is hired at The Tennessean and covers the civil rights movement, poverty and state politics. Kovach studies for a year at Stanford University on a journalism fellowship. While at the Tennessean, Kovach sends his clips to The New York Times. This helped his eventual hire, and in 1968 he begins his 18-year career at the Times. Kovach starts at the metro desk and less than a year later is moved to the Albany bureau to cover the New York state legislature. Kovach’s next jump is to the Times national desk, moving to Boston to head the New England bureau. Reporting on the anti-war movement, Kovach becomes known as a trustworthy journalist in that community for protecting sources and understanding the issues. When an anti-war group breaks into an FBI office in Media, Pa., the group sends the documents to him. Kovach uses the documents to report on FBI informants. Kovach moves to the Washington bureau. Over the next couple of years, he covers the Watergate hearings. Named as Washington news editor of the Times, Kovach quickly gains the trust of the reporters working under him. In any situation, he assumes the reporter is right until proven otherwise. It is during this brief, exciting period that Seymour Hersh works for the Times in the Washington bureau and advances the Watergate story, helping to make the newspaper more competitive with The Washington Post. Kovach becomes the deputy national editor and moves to New York. The New York Times names Kovach the Washington bureau chief. After he is passed over for the managing editor position, Kovach leaves the Times to become executive editor of the Atlanta Journal-Constitution.15 During his two years at the paper, Kovach oversees projects that win two Pulitzer Prizes (the first two for the paper in 20 years). After several confrontations with corporate owners over newsroom priorities, Kovach resigns during a heated argument with publisher Jay Smith. After spending one year as a Nieman Fellow at Harvard University, Kovach stays on as curator of the program, replacing his friend, the former Washington Post managing editor Howard Simons. Kovach remains the curator until 2000, when he is succeeded by Bob Giles. In a remarkable meeting with 24 other journalists at the Harvard Faculty Club to discuss the increasing problems facing journalism, the Committee of Concerned Journalists (CCJ) is born and Kovach becomes its founding chairman. Collaborating with Tom Rosenstiel, he writes “Warp Speed: America in the Age of Mixed Media.” CCJ and the Project for Excellence in Journalism at the Pew Research Center both did significant work that made up the foundation of the book. The book examined the effects of a continuous news cycle on journalism. After three years of research by CCJ into what were the core principles of journalism, which included 21 public forums attended by 3,000 people and testimony from more than 300 journalists, Kovach teams up again with Rosenstiel to write “The Elements of Journalism: What Newspeople Should Know and the Public Should Expect.” The book is updated in 2007 and is printed in 20 languages. When USA Today reporter Jack Kelley is discovered to have fabricated many of his stories , the paper turns to Kovach, Bill Hilliard and John Seigenthaler to monitor the investigation. Kovach is named the John Seigenthaler Chair in Excellence in First Amendment Studies at Middle Tennessee State University. The Society of Professional Journalists honors Kovach as a Fellow of SPJ. Kovach becomes a faculty member at the University of Missouri School of Journalism. Kovach writes his third book with Rosenstiel, “Blur: How to Know What’s True in the Age of Information Overload.” The book defines six tools for interpreting news and provides a road map on how news consumers can know what information is true in an age of bloggers and the Twitter echo chamber. In an interview with the Center for International Media Ethics , Kovach discusses the changes in journalism caused by technology, tighter networks and sensationalism. Throughout his career, Kovach supervised reporting projects that won four Pulitzer Prizes. “Warp Speed: America in the Age of Mixed Media” (with Tom Rosenstiel). New York: Century Press, 1999. “The Elements of Journalism: What Newspeople Should Know and the Public Should Expect” (with Tom Rosenstiel). New York: Three Rivers Press, 2001. “Blur: How to Know What’s True in the Age of Information Overload” (with Tom Rosenstiel). New York: Bloomsbury, 2010. Interview with Charles Lewis in Washington, DC, June 28, 2007. Morrison, Blake. “Ex-USA Today Reporter Faked Many Stories.” USA Today. March 19, 2004. Shumate, Richard. “Life after Kovach.” American Journalism Review, September 1992. Thompson, Tracy. “A Newsroom Hero.” Washington Monthly, May 2000.